As many tourists have discovered Italy has many wondrous sights on offer. But of course there is a payoff to such rich history and culture: expense. That dreaded word that the average tourist shudders about. Europe has a habit of chewing through income like a fat kid going through chocolate cakes. But of course there has to be a way around expenses and indeed we can now take you through a personal, handpicked selection of the best 10 free things to do in Rome. Undoubtedly the most magnificent water feature in Europe, the Trevi Fountain is one of the most detailed and well-designed architectural pieces of the ancient past. Being out in the open air you can swing by the Piazza di Trevi anytime to see this incredible sight. Construction of the fountain started in 1732 and was completed in 1762, being made of marble and travertine, a type of limestone. The fountain was originally supplied by the Aqua Virgo, a 22km long aqueduct that used to feed drinking water to the people of Rome. Assuming you are staying further away from the center of Rome the best way to access the Trevi Fountain is to walk from the nearby train station. Getting off at Barberini station lets you easily walk the 400 metres to the Trevi. The Pantheon from the front is stunning at night. Photo by Oliver K.
If you are more of a history buff you can easily walk through the Pantheon, a temple dedicated to all of the Roman Gods. The ancient Romans after defeating an empire, would offer the Gods of the defeated culture a home within Rome thus adopting them. As such Rome continued to add to its Polytheistic beliefs. The Pantheon was thus constructed as a temple in which any God could be worshipped, a contrast to the typical one God one temple system that Rome often used. Many overlook the Circus Maximus as just a dustbowl; however it is an important historical site to be seen. Ruins of ancient Rome dot the site and you can walk up the hill to get a closer look if you feel a little adventurous. The Circus Maximus was used as a racing stadium during ancient times. Chariot races were held often, being sponsored by wealthy Roman citizens striving to become a part of the Senate. Being able to hold 150,000 spectators, the chariot races were fast and often brutal, crashes and deaths of riders and horses was commonplace. The Piazza della Repubblica is a beautifully constructed, massive piazza in the centre of Rome. From a distance this Piazza looks just like a massive, very well decorated roundabout and indeed if you just pass through that’s all you can see. But the fast moving traffic of Rome is not the way to sight see, you have to get out and start walking. The architecture of the Piazza is a testament to the beauty of Rome. Arches support the numerous hotels that make up the Piazza, with the ground floor being littered with fashion retailers and restaurants which cater to the cities most wealthy. To get to the Piazza you can easily catch a train to Repubblica station. From the Piazza you can actually walk the 1km to the Colosseum. Located right near the Colosseum, the Arch of Constantine is a massive ancient Roman celebration of the civic and military victories of Emperor Constantine. The most dominant reliefs on the arch are those that celebrate Constantine’s military victory over Maxentius, a former emperor of Rome. This is widely celebrated as Constantine was seen as a saving force for the Roman Empire, which had begun to decline in its prestige due to poor rule. The fresco’s which cover the arch are of an exceptional detail, making it quite easy to become immersed within the story being told. We would suggest reading up on the history of Constantine and his political leadership, as it makes seeing the sites of Rome much more fulfilling. You can access the arch by walking from the Colosseum, accessed by the metro system. The Borghese gardens are a stunning entrance to the incredible architecture and workmanship which is on show within the gallery of the Borghese Villa. Unfortunately you have to pay to see these magnificent works of art, but with the showing off of the best of Bernini it is a must see. The Borghese Gardens are like walking into a different world, the lush green grass and trees are only more highlighted by the incredible white marble statues which line the pathways in every direction. There are gardens dedicated to fruits off to the side of the Borghese villa, but the true masterpiece is the 19th Century ‘Temple of Aesculapius’ built overlooking a lake, this shrine is captured within massive trees and makes for the best photography you can experience whilst in Rome. Everybody should visit the ancient Roman forum. Being the centrepiece of ancient civilisation, Rome had some of the most exquisite architectural achievements that mankind has produced and the ruins of the forum of Rome certainly prove this. Looking through the ruins you can get a sense of the might that must have been Rome, massive granite columns broken down over centuries can give you a clear picture of the empire that was. To access the forum just walk over from the Colosseum, it is only around 200m. One of the more famous stairways in the world, the Spanish Steps is a sure thing to see whilst in Rome. Located within the Piazza di Spagna, the Spanish Steps are surrounded by the culture of Italy. At the top lies the Trinta dei Monti Church, a late renaissance piece which can be accessed without fee. Currently restoration works are being held, which might stop you from getting in. At the bottom of the steps lies the remainder of the Piazza di Spagna, an area now dominated by luxury brands and an absolute pile of tourists. Be warned of pickpocketing as it commonplace, however if you are careful you should have no problems. Take the metro to Spanga and it is a short walk to the Spanish Steps. The Castel Sant’ Angelo is an incredible site to see whilst in Rome and serves as a great gateway to enter the Vatican. 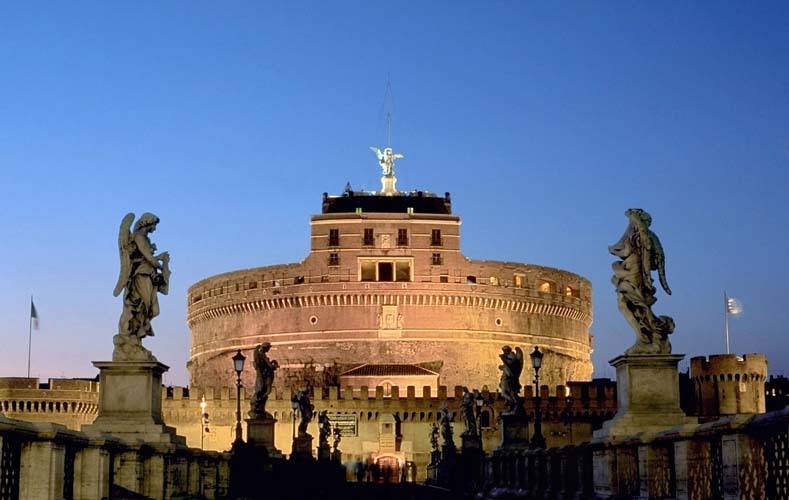 The Castel Sant’ Angelo was commissioned by Emperor Hadrian, arguably one of the most famous Roman emperors. During ancient times the Castel was the tallest building in Rome. The Tiber River flows just before the Castel making the view from the top of the Castel that much more breath taking. The Castel is most notable for its Baroque additions of statues holding aloft depictions of Jesus Christ. The Castel acted as the tomb for many Roman emperors, however during later times much of the tombs that had remained where destroyed and their contents looted. To get to the Castel you can catch the metro to Lepanto station and walk over. It should only take you 15 minutes from the station. Of course some would argue that the Vatican is outside of the city of Rome being its own state, but really, when in Rome go to the Vatican. Religion aside the Vatican houses some of the most spectacular architecture in all of the Italian area. Obelisks from Egypt as well as incredible areas like St. Peter’s Square showcase the extent to which the Vatican and its message have spread through the world. Much of the architecture has its roots with some of the most famous architects in human history, Bernini and Michelangelo being the two biggest names. If you have the time, explore the Vatican as there are so many sites to see within its walls. To get there just walk across from Rome, use Castel Sant’ Angelo as a guideline for your journey.